To celebrate the Seiji Ozawa Music Academy Opera Project XVII, “Seiji Ozawa Music Academy Exhibition 2019” opened today for nearly 4 months at ROHM Theatre Kyoto Music Salon. 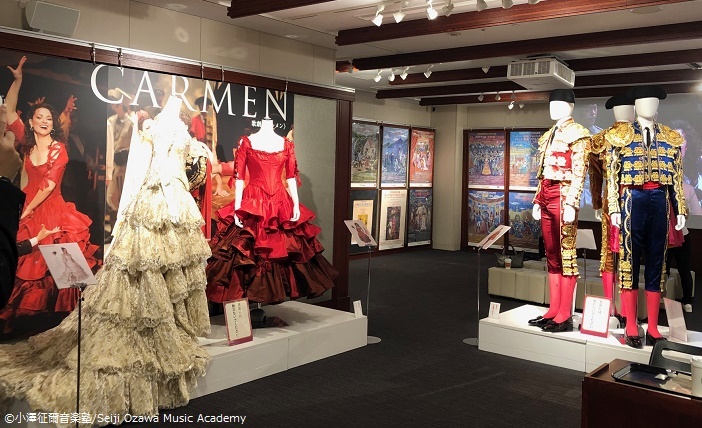 You can see 5 sets of valuable wardrobes from “Carmen” at the Part 1. There are brief introduction of the background of the opera and about the great writer G.Bizet himself. Also you can enjoy footage videos from 2017 production of “Carmen” with same leading roles. In Part 2, we will have exhibition to introduce the history of Seiji Ozawa Music Academy using photos and old poster visuals. will be concurrently held with above at 1F promenade.